Welcome to Reading with Your Kids Podcast where we introduce you to the most amazing children’s, middle grade and young adult authors from various genres from around the globe. Stay tuned and you never know you might meet your new favorite author today! Today, our guest is a very talented children’s author Alva Sachs. Alva is joining us to talk about her latest release Dancing Dreidels, a fun children’s book, with creative illustrations by Patricia Krebs that beautifully shares the wonders of Hanukkah with young readers and their families. Alva Sachs was born and raised in Chicago, Illinois. After receiving her Bachelor of Science from the University of Illinois, and Master’s of Education from Northern Illinois University, she taught elementary school for sixteen years. She now resides in Calabasas, California with her husband, Paul, and their Schnoodle, Sadie. Reading to her classes over those years were some of Alva’s most treasured memories. Her love of teaching and raising her own three children led her to follow her dream to write books for children. As a Board Vice President of the Angels of the Alliance at the Thousand Oaks Civics Arts Plaza, Alva helps to raise funds for Title 1 schools to experience live theatre performances. 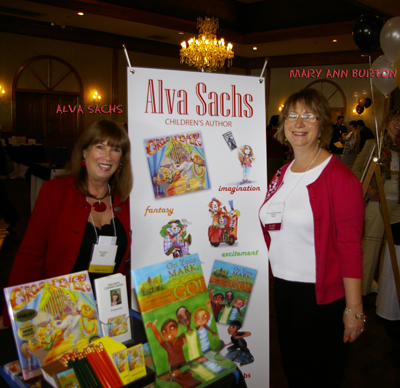 Alva writes stories to engage, excite, and empower young children at an early age for the sheer joy of reading. She believes at the onset a child learns to read and then reads to learn. This is the recipe for reading to where imagination can take flight and creativity soars. CIRCUS FEVER honors include Creative Child Magazine 2009 Seal of Excellence FINALIST 2009 National Indie Award for Excellence, and FINALIST by Best Books of 2009-USA BOOK NEWS. Honorable Mention in 2008 at the Hollywood Book Festival, and the IRWIN AWARD 2008 for the most motivational campaign. Dancing Dreidels is a delightful story of Rebecca and her four favorite dreidels. Rebecca waits for Hanukkah every year when the family gathers to celebrate. The smells of yummy food fill the air. Singing, dancing, and the lighting of the menorah take center stage until it is time for the dreidels to spin for the evening’s grand finale. But, Sheila can’t stop falling down. Will she be able to ‘dance’ at the Hanukkah party? *A dreidel is a pointed four-sided spinning top played with at Hanukkah. Click the Amazon link below to grab your copy today to learn more about Hanukkah and the dreidels! More about this award-winning Children’s Author of several children’s book including Dancing Dreidels, Circus Fever, I’m 5, Dear Master Dragon, On Your Mark, Get Set, Go! We asked Alva how is she feeling about her book? What’s it like having the book out in the world? How long had she been working on it, from start to publication? Where did Alva get the inspiration to write this story? The most important thing the Alva wants readers to gain from her books? We would like to say a huge thank you to Alva for doing this interview and we are very excited to see what she does next! We hope you have enjoyed listening to this episode and be sure to keep your eye out for her future books. Where online can people find Alva? Read NextSunday Special with Paul Hoffman & Nick Patton! !